Rear-view extensions mirrors are required by law to be fitted to most cars while towing a caravan. The improved rear and peripheral vision they provide significantly reduces the risk of accidents. Although the laws relating to mirrors changed in 2010, the situation is still quite complex. The reality is that the vast majority of caravanners’ towcars will, in the eyes of the law, require two additional towing mirrors (extension mirrors) in order to tow a caravan legally. Most standard mirrors do not provide an ‘adequate’ view to the rear when a caravan is added, unless it is the same width as the car or less. It is possible that a large towing vehicle (eg a 4x4) with a relatively narrow caravan might achieve this, but even if that is the case, fitting additional mirrors will further improve your vision to the rear of the outfit. Therefore, additional mirrors will normally need to be fitted on the nearside and offside when towing, but removed when driving solo. As a rule of thumb for a typical car-caravan combination, you need to be able to see a zone at least 4-5m wider than the caravan at a distance of about 10-20m behind the caravan. Imagine being in the middle lane on a motorway, you need to see an approaching vehicle either side of your outfit. Information - Unsure if your mirrors are legal? 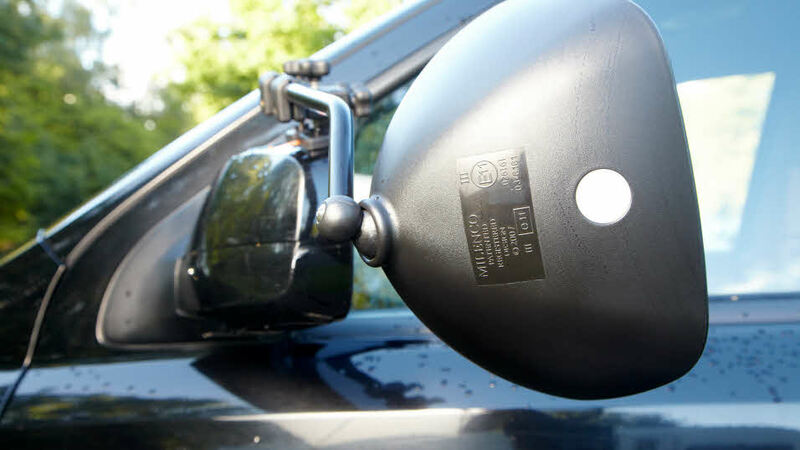 If you are unsure of the legality of your car mirrors in providing an ‘adequate’ view to the rear, we recommend that you purchase a pair of towing mirrors that are approved to EU directives 2003/97 or 2005/27. These are generally quick and easy to fit, and can be used on the nearside or offside. The mirror face is often adjustable. Methods of attachment vary, but often one or more straps loop around the back of the existing mirror and are tightened to provide a secure fit. Most mirrors are of this type, including most of the cheaper options. These often grip on the door underside and slot into the space between the side window and the window rubber. They are adjustable from the driving position and tend to vibrate less than wing-mounted types.